White furry pests on tomato plants & spreading. 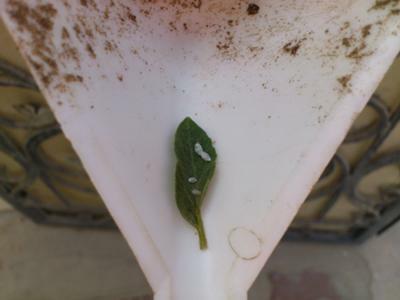 What are these pests & what is the best 'natural' method sans pesticides of eliminating them...these pests i encounter in Bangalore, India climate & also @ other extreme in abu-dhabi, uae. On tomato plants & spread to other plants. Comments for White furry pests on tomato plants & spreading. Just happened to stumble across this blog and saw your post. I'm not saying its a sure fire thing, but you might want to order some ladybugs and unleash them on your pests. We've done it when we had aphids, and they annihilated those little buggers! Mix a tablespoonful of Molasses in a one liter spray bottle, add a touch or a drop of dish washing soap. Give the spray bottle a good shake and spray on the leaves. The sugar will help make the leaves stronger and the soap will allow it to adhere to the leaves. Spay weekly, hope that helps. If your plants are healthy and have a lot of juice, not dry and papery, the bugs will leave them alone.